n. 1. The acts or processes of editing or revising writings; preparations for publication. 2. Edited works; new editions or revisions. 3. A journal of poetry and poetics that is published every nine months and that welcomes: poems; poetry book reviews; translations; manifestos; essays concerning poetry, poetics, poetry movements, or a specific poet or a group of poets; and anything dealing with poetry. 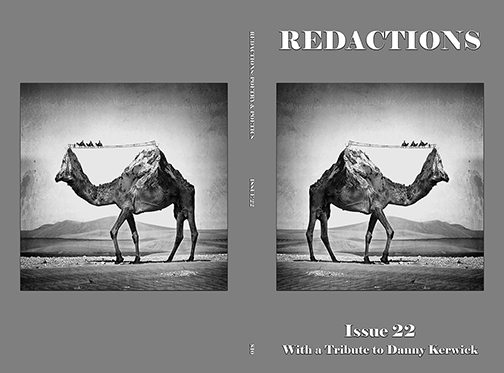 Redactions no longer publishes fiction or creative non-fiction. Issue 22 will be available by June 12, 2018. For issue 23 (due out it May 2019), we are looking for general submission and submisstions to celebrate Walt Whitman's 200th birthday. For submission information and submitting to the Walt Whitman tribute, please visit the Submissions and Ordering page for more details.